A boxing champion helped to unveil a new home for a successful amateur boxing club. It was a real community effort because it was opened with the help of local volunteers and organisations. IBF World Super Middleweight Champion and Olympic gold medallist James DeGale was there when Powerday Hooks Amateur Boxing Club officially moved into a building in Popes Lane, Acton. 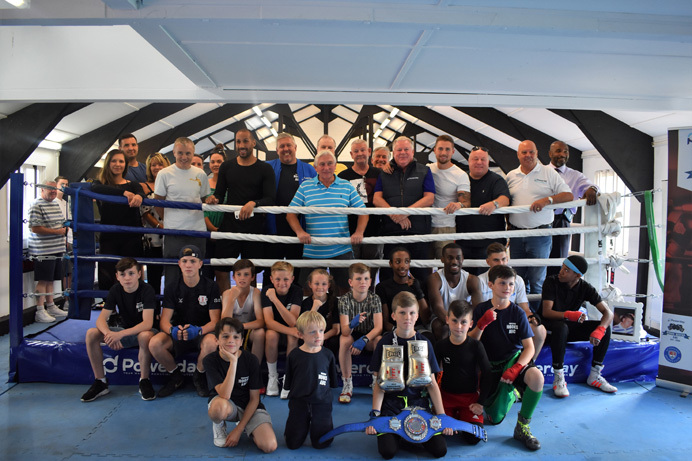 It meant the club finally had into a permanent home after nine years without one – despite being very active in the community and also producing successful amateur boxers. The building in Acton needed converting to make it suitable for the club, and to be modernised. Volunteers were needed to muck in and get their hands dirty to get the work done. Powerday funded the new changing facilities and training equipment, with support from the ward forums and Sport England. The club has produced 30 champions in the past as well as carrying out voluntary work in the community to help young people avoid getting into trouble – work it now intends to extend thanks to its new headquarters. Indeed, although it has one of the largest memberships in London boxing, the club is also involved in a variety of outreach work with other agencies, such as the council’s sport development team. The new gym will allow the club to open longer to make it more available to use for intervention work and also attract new people to sport – with extra coaching sessions. Through close association over the last six years with the family of Luke Fitzpatrick (who, tragically, was stabbed to death by a group of young people) the club has also staged events to raise awareness about knife crime and to honour Luke’s memory. The new headquarters will be used to encourage young people to take part in controlled and disciplined sporting experiences and also social activities, with the aim of breaking down barriers and helping them to build positive new relationships. The club was founded by Mr Newland in 2009, just after James DeGale had won his Olympic gold medal in Beijing. Steve had coached and mentored James to this Olympic success and had a desire to establish his own club. "But our impact in providing positive activities for the community and young people has also been inspirational and a focus of our voluntary provision, which we can now extend within our own premises". We are seeking to relocate the nationally famous community based Hooks Amateur Boxing Club to a new space in Popes Lane. The new space will be turned into a Boxing Gym with the help of volunteers.